Just the other day I was looking over at GameRankings.com, a site that offers links to all the various reviews of a particular game, and it combines them to form an aggregated score. In particular I was looking to see how the various Zelda games racked up against one another, and the results I found were a bit surprising. It was no shock that Ocarina of Time topped the list, but how the games fell in line afterwords, was a bit surprising. Missing from the list above, is the original Legend of Zelda and Zelda II: The Adventure of Link, primarily because there just aren’t many reviews for these classics, and I didn’t think the GBA Classic Series re-releases did them justice critically. Four Swords and Four Swords Adventures were also not included, as the list was focusing on games that were primarily single player titles. Obviously games such as the Tingle titles, Cd-I titles, and other smaller spin-offs were not included. It seems that after Ocarina of Time, there is a notable drop, and then Twilight Princess, Wind Waker, and A Link to the Past fall in line. After that, there is a cluster of 5 Zelda titles fitting within roughly 1.5 percentage points. There is drop-off with Phantom Hourglass, and another notable drop-off with Spirit Tracks. The meaning for these lower reviews is open for interpretation, and I really cannot point my finger as to why they are so low. From a critical stand point, I cannot see how Phantom Hourglass would be lower than a game like The Minish Cap, since in general, reviewers seem to look for new features and unique experiences, and I think the move to the Nintendo DS really did that for Zelda, but not so much the jump to the GBA with the Minish Cap. So from a fans perspective, what do you guys think of such a list. Do the critical reviews of these Zelda titles match up to how you rank them in the Zelda series. 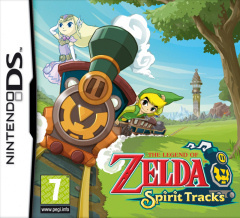 Does Spirit Tracks really deserve the lowest rank amongst the single player Zelda titles? Let us know in the comments below.